Imagine that the fate of your species depended upon some of the most densely populated, strife-torn, environmentally stressed and, in some cases, corrupt places in the world. That is where the future of the Siberian crane lies. 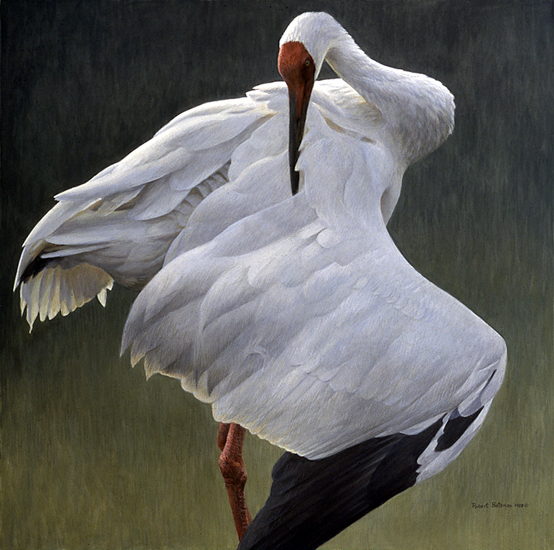 The International Crane Foundation in Baraboo, Wisconsin plans to use the image in this painting in posters published in 8 or 9 different Asian languages -- Russian, Chinese, Hindi, Urdu, Farsi, Uzbeki, Afghana-yi and others. They plan to display these posters in towns and villages throughout the distribution area of the Siberian cranes. The western population is down to about 10 birds, the central population has been reduced to 2. The eastern population of approximately 2500 birds is threatened by the Three Gorges Dam in China. These magnificent birds are the Asian equivalent of the whooping crane. With international efforts and of course financing, the good news story of the whooping cranes could be repeated. At one point their numbers were down to 14 and now there are 300-350 birds. I based this painting on one of the Siberians at the ICF. He is not preening, he is in a "sabre threat pose". If you dont get the hint, his next step is to jump you and either spear you with his beak or rake you with his claws. I was very taken by the abstract form in his defiant pose. I hope that in some small way it will help to get the attention of enough people to bring the Siberian crane back from its course towards extinction.